Explanation: Sometimes the unknown is beautiful. 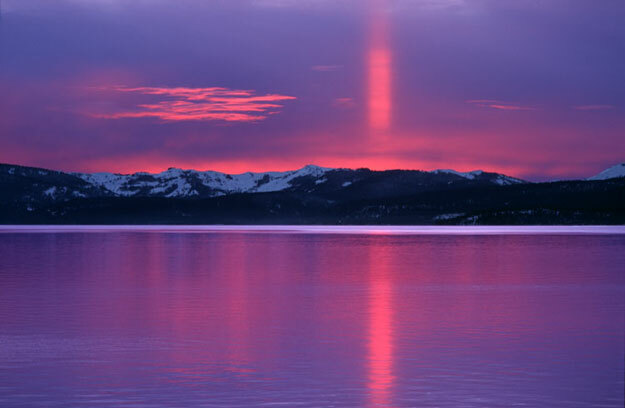 In 2000 February near Lake Tahoe, Nevada, two amateur photographers noticed an unusual red column of light rise mysteriously from a setting sun. During the next few minutes, they were able to capture the pillar and a photogenic sunset on film. Pictured above, the red column is seen above a serene Lake Tahoe and snow-capped mountains across from Lake Tahoe-Nevada State Park. The mysterious column, they learned later, is a Sun Pillar, a phenomenon where sunlight reflects off of distant falling ice crystals.